George McCuaig was an auctioneer and commission merchant. He lived at 1102 Gilford Street from 1904 to 1918. George McCuaig was born on the Island of Islay in Argyleshire, Scotland, on October 24, 1852. His father was Henry Mccuaig (1797-1881). His mother was Janet Calder (1808-1873). The McCuaig family moved to Canada in 1857, and settled in Oro, near Barrie, Ontario. George’s first job was with a dry goods business in Barrie. In 1881, George went to Winnipeg, Manitoba. In 1883 he was a commercial traveller for the dry goods firm of Rowe Newton and Company. 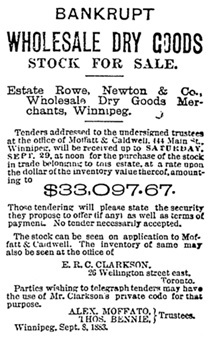 Rowe and Newton ran into financial difficulties in 1883, and they were forced to assign their assets to a trustee. During the Riel Rebellion of 1885, George was a member of military corps at Medicine Hat. He obtained an autograph from Louis Riel, and he later donated the autograph to the Vancouver Public Library. In 1891, George travelled to Africa. By 1899 he was back in Vancouver, acting as a manufacturers agent. Vancouver City Directory, 1899-1900, page 217. About 1900, George was the secretary of the B.C. and London Trade Sale, Jobbing and Commission Company Limited. By 1901 he had established his own business, called the McCuaig Auction and Commission Company. George’s auction business was involved in many aspects of Vancouver’s business and personal life. He would sell the stock of businesses that had failed, and he would auction the contents of houses when people were moving. George and Sarah appeared in the 1914 Vancouver Social and Club Register. George carried on his auction business through the 1920s until the early 1930s. He was a member of St. Andrew’s Presbyterian Church, the Mount Hermon Lodge, A.F. & A.M., and the Independent Order of Odd Fellows. George died in Vancouver on June 16, 1932. He was buried in the Masonic Cemetery in Burnaby, British Columbia. Sarah died in Vancouver on June 11, 1958. She was buried in the Masonic Cemetery in Burnaby. George and Sarah had a son. Gordon Campbell McCuaig was born in Vancouver on May 16, 1905. He worked as a bookkeeper. On November 2, 1929, in Vancouver, Gordon married Marjorie Florence Beaumont. She was born in London, England, about 1910. Her father was Frederic George Beaumont. Her mother was Florence Benson. Gordon later worked as a taxi driver. On the evening of October 9, 1936, he was driving two other taxi drivers home. While he was going across the old Granville Street Bridge, he lost control of the taxi, which crashed into a street car and then into another car. Gordon died in hospital on the morning of October 20, 1936. He was buried in the Masonic Cemetery in Burnaby. “Scotland Census, 1841,” database, FamilySearch (https://familysearch.org/ark:/61903/1:1:VYCY-2Y7 : accessed 31 May 2016), Henry Mccuaig, Oa, Argyllshire, Scotland; from “1841 England, Scotland & Wales census,” database, findmypast (http://www.findmypast.com : 2012); citing p. 12, PRO HO 107, New Register House, Edinburgh; FHL microfilm 1,042,720. “Canada Census, 1871,” database, FamilySearch (https://familysearch.org/ark:/61903/1:1:M47Y-Y3H : accessed 31 May 2016), Henry Mc Cuaig, Oro, North Simcoe, Ontario, Canada; citing p. 37, line 18; Library and Archives Canada film number C-9964, Public Archives, Ottawa, Ontario; FHL microfilm 4,396,755. “Canada Census, 1881,” database, FamilySearch (https://familysearch.org/ark:/61903/1:1:MVFZ-JP6 : accessed 31 May 2016), Henry McCuaig, Oro, Simcoe North, Ontario, Canada; citing p. 35; Library and Archives Canada film number C-13251, Library and Archives Canada, Ottawa, Ontario; FHL microfilm 1,375,887. “Find A Grave Index,” database, FamilySearch (https://familysearch.org/ark:/61903/1:1:QVLX-3QSG : accessed 31 May 2016), Henry McCuaig, ; Burial, Oro-Medonte, Simcoe, Ontario, Canada, Knox Presbyterian Cemetery; citing record ID 97418536, Find a Grave, http://www.findagrave.com/cgi-bin/fg.cgi?page=gr&GRid=97418536. “Canada Census, 1871,” database, FamilySearch (https://familysearch.org/ark:/61903/1:1:M47Y-Y3C : accessed 31 May 2016), Janet Mc Cuaig in household of Henry Mc Cuaig, Oro, North Simcoe, Ontario, Canada; citing p. 37, line 19; Library and Archives Canada film number C-9964, Public Archives, Ottawa, Ontario; FHL microfilm 4,396,755. “Ontario Deaths, 1869-1937 and Overseas Deaths, 1939-1947,” database with images, FamilySearch (https://familysearch.org/ark:/61903/1:1:JDR5-MMF : accessed 31 May 2016), Janet Mccuaig, 01 Aug 1873; citing Oro, Simcoe, Ontario, yr 1873 cn 38399, Archives of Ontario, Toronto; FHL microfilm 1,846,470. “Ontario Deaths, 1869-1937 and Overseas Deaths, 1939-1947,” database with images, FamilySearch (https://familysearch.org/ark:/61903/1:1:JDTJ-8NY : accessed 31 May 2016), Janet Mccuaig, 01 Aug 1873; citing Oro, Simcoe, Ontario, yr 1873 cn 9198, Archives of Ontario, Toronto; FHL microfilm 1,846,469. George McCuaig, auctioneer and commission merchant of Vancouver, was born in Scotland, October 24, 1852, a son of Henry and Janet McCuaig. In the year 1857 the family left the land of hills and heather and started for Canada on a sailing ship which was nine weeks on the voyage. The son George was then a lad of but four years, so that practically his entire life has been passed on this side of the water. He was reared in Barrie, Ontario, where he attended the public schools and then entered the dry-goods business in Barrie, remaining there until 1881, when he made his way westward to Winnipeg. Ten years were spent in that city and in the territories and in 1891 he arrived in Vancouver. Through the succeeding three years he managed a dry-goods store for George I. Wilson, and in 1894 left for Africa, where he spent four years. In 1899 he returned to Vancouver, where he established business as an auctioneer and commission merchant, in which line he still continues. He has a well -appointed establishment and so conducts his trade as to gain substantial and well merited returns. His judgment is sound in placing valuations upon any articles which he handles and he has become well known to the purchasing public as one whose stock is extensive and whose business integrity is unassailable. George McCuaig; http://www.gwennyalogy.org/ps20/ps20_311.htm: George McCuaig; Birth: 5 Aug 1852, Argyleshire, Scotland; Death: 16 Jun 1932, Vancouver, British Columbia; Father: Henry McCuaig (1797-1881); Mother: Janet Calder (-1873). Marriage: 23 Aug 1900, Vancouver, British Columbia. “Scotland Births and Baptisms, 1564-1950,” database, FamilySearch (https://familysearch.org/ark:/61903/1:1:XTJ7-B5H : accessed 29 May 2016), George Mccuaig, 24 Oct 1852; citing , reference – 2:15D1X1R; FHL microfilm 1,041,080. “Canada Census, 1871,” database, FamilySearch (https://familysearch.org/ark:/61903/1:1:M47B-7Z1 : accessed 30 May 2016), George Mc Cuaig, Oro, North Simcoe, Ontario, Canada; citing p. 38, line 2; Library and Archives Canada film number C-9964, Public Archives, Ottawa, Ontario; FHL microfilm 4,396,755. “Canada Census, 1891,” database, FamilySearch (https://familysearch.org/ark:/61903/1:1:MWK3-MTR : accessed 31 May 2016), Geo Mccuaig, Vancouver City, New Westminster, British Columbia, Canada; Public Archives, Ottawa, Ontario; Library and Archives Canada film number 30953_148093. “British Columbia Marriage Registrations, 1859-1932; 1937-1938,” database with images, FamilySearch (https://familysearch.org/ark:/61903/1:1:JDZX-W8Q : accessed 29 May 2016), George Mccuaig and Sarah Ann Mccuaig, 23 Aug 1900; citing Vancouver, British Columbia, Canada, British Columbia Archives film number B11372, Vital Statistics Agency, Victoria; FHL microfilm 1,983,529. “Canada Census, 1901,” database, FamilySearch (https://familysearch.org/ark:/61903/1:1:KHVN-RJ4 : accessed 31 May 2016), George Mccuaig, D, Burrard, British Columbia, Canada; citing p. 8, Library and Archives of Canada, Ottawa. “Recensement du Canada de 1911,” database, FamilySearch (https://familysearch.org/ark:/61903/1:1:QV95-MP6H : accessed 31 May 2016), George Mccuaig, 1911; citing Census, Vancouver Sub-Districts 1-18, British Columbia, Canada, Library and Archives of Canada, Ottawa, Ontario; FHL microfilm 2,417,661. 1921 Canada Census, George McCuaig (indexed as George Mcsusig); Reference Number: RG 31; Folder Number: 19; Census Place: Point Grey (Municipality), Vancouver South, British Columbia; Page Number: 5; Ancestry.com. 1921 Census of Canada [database on-line]. Provo, UT, USA: Ancestry.com Operations Inc, 2013. “British Columbia Death Registrations, 1872-1986; 1992-1993”, database with images, FamilySearch (https://familysearch.org/ark:/61903/1:1:FL26-ZGZ : accessed 29 May 2016), George Mccuaig, 1932. “Death Takes City Pioneer; George McCuaig, 80, Veteran Auctioneer, Died This Morning; Came West in 1881,” Vancouver Province, June 15, 1932, page 20 [includes photograph of George McCuaig]. Death claimed another well-known citizen of Vancouver this morning when George McCuaig, aged 80, of 3394 West Twenty-fifth, pioneer auctioneer, died at the family residence following a prolonged illness. He had been in ill-health all winter, and had been confined to bed for six weeks. A native of Scotland, he came to Canada with his parents in a sailing ship in 1857. He spent his boyhood days in Barrie, Ont. He remained there until 1881, when he went to Winnipeg. He spent ten years there before coming to Vancouver in 1892. For three years he managed a dry-goods store here, then went to Africa, where he lived for four years. In 1899 he returned to Vancouver, entering business as an auctioneer and commission merchant. The deceased was a member of a military corps at Medicine Hat during the Riel Rebellion of 1885. He obtained an autograph of Riel, and this historic souvenir is now in Vancouver Public Library. He married Miss Sarah Campbell in this city in 1900. Besides his wife, he is survived by a son, Gordon Campbell McCuaig. For many years, the deceased was connected with the old St. Andrew’s Presbyterian Church. He was an active member of Mount Hermon Lodge, A.F. & A.M., and Independent Order of Odd Fellows. “Canada Census, 1871,” database, FamilySearch (https://familysearch.org/ark:/61903/1:1:M479-J28 : accessed 30 May 2016), Sarah Campbell in household of Roderick Campbell, Mariposa, South Victoria, Ontario, Canada; citing p. 49, line 20; Library and Archives Canada film number C-9980, Public Archives, Ottawa, Ontario; FHL microfilm 4,396,620. “Canada Census, 1881,” database, FamilySearch (https://familysearch.org/ark:/61903/1:1:MVXY-2WH : accessed 29 May 2016), Sarah Campbell in household of Roderick Campbell, Mariposa, Victoria South, Ontario, Canada; citing p. 38; Library and Archives Canada film number C-13242, Library and Archives Canada, Ottawa, Ontario; FHL microfilm 1,375,878. “Canada Census, 1901,” database, FamilySearch (https://familysearch.org/ark:/61903/1:1:KHVN-RJH : accessed 31 May 2016), Sarah A Mccuaig in household of George Mccuaig, D, Burrard, British Columbia, Canada; citing p. 8, Library and Archives of Canada, Ottawa. “Recensement du Canada de 1911,” database, FamilySearch (https://familysearch.org/ark:/61903/1:1:QV95-MP6C : accessed 31 May 2016), Sarah Mccuaig in entry for George Mccuaig, 1911; citing Census, Vancouver Sub-Districts 1-18, British Columbia, Canada, Library and Archives of Canada, Ottawa, Ontario; FHL microfilm 2,417,661. 1921 Canada Census, Sarah Ann McCuaig (indexed as Sarah Ann Mcsusig) in household of George McCuaig (indexed as George Mcsusig); Reference Number: RG 31; Folder Number: 19; Census Place: Point Grey (Municipality), Vancouver South, British Columbia; Page Number: 5; Ancestry.com. 1921 Census of Canada [database on-line]. Provo, UT, USA: Ancestry.com Operations Inc, 2013. “British Columbia Death Registrations, 1872-1986; 1992-1993”, database with images, FamilySearch (https://familysearch.org/ark:/61903/1:1:FLRM-NYJ : accessed 29 May 2016), Sarah Mccuaig, 1958. “Recensement du Canada de 1911,” database, FamilySearch (https://familysearch.org/ark:/61903/1:1:QV95-MP6Z : accessed 31 May 2016), Gordon Mccuaig in entry for George Mccuaig, 1911; citing Census, Vancouver Sub-Districts 1-18, British Columbia, Canada, Library and Archives of Canada, Ottawa, Ontario; FHL microfilm 2,417,661. 1921 Canada Census, Gordon Campbell McCuaig (indexed as Gordon Campbell Mcsusig) in household of George McCuaig (indexed as George Mcsusig); Reference Number: RG 31; Folder Number: 19; Census Place: Point Grey (Municipality), Vancouver South, British Columbia; Page Number: 5; Ancestry.com. 1921 Census of Canada [database on-line]. Provo, UT, USA: Ancestry.com Operations Inc, 2013. “British Columbia Marriage Registrations, 1859-1932; 1937-1938,” database with images, FamilySearch (https://familysearch.org/ark:/61903/1:1:JD8X-C5X : accessed 29 May 2016), Gordan Campbell Mccuaig and Marjorie Florence Beaumont, 02 Nov 1929; citing Vancouver, British Columbia, Canada, British Columbia Archives film number B13757, Vital Statistics Agency, Victoria; FHL microfilm 2,074,553. “British Columbia Death Registrations, 1872-1986; 1992-1993”, database with images, FamilySearch (https://familysearch.org/ark:/61903/1:1:FLLY-R8B : accessed 29 May 2016), , 1936. “Taxi Driver Dies After Granville Bridge Crash,” Vancouver Sun, October 20, 1936, page 1; https://news.google.com/newspapers?id=r_RlAAAAIBAJ&sjid=FokNAAAAIBAJ&pg=1564%2C2319004, [includes diagram of accident scene]; page 14: https://news.google.com/newspapers?id=r_RlAAAAIBAJ&sjid=FokNAAAAIBAJ&pg=2939%2C2395110. George Campbell McCuaig, death notice, Vancouver Province, October 22, 1936, page 15; Vancouver Sun, October 22, 1936, page 13; https://news.google.com/newspapers?id=sfRlAAAAIBAJ&sjid=FokNAAAAIBAJ&pg=1182%2C2628923: “McCuaig—Passed away Oct. 19, 1936, Gordon Campbell McCuaig of 1111 W. George Str., in his 32nd year. Survived by his wife and mother. Funeral service Friday, Oct. 23rd, at 2:30 p.m., in Nunn & Thomson’s funeral chapel, 10th and Cambie, Rev. Dr. W. Brewing officiating. Interment Masonic Cemetery, Burnaby. “California Death Index, 1905-1939,” database with images, FamilySearch (https://familysearch.org/ark:/61903/1:1:QKSM-VLHS : accessed 31 May 2016), George I Wilson, 16 May 1924; citing 22965, Department of Health Services, Vital Statistics Department, Sacramento. “Find A Grave Index,” database, FamilySearch (https://familysearch.org/ark:/61903/1:1:QVV5-WHTC : accessed 31 May 2016), George Ingram Wilson, 1924; Burial, Vancouver, Greater Vancouver Regional District, British Columbia, Canada, Mountain View Cemetery; citing record ID 26302632, Find a Grave, http://www.findagrave.com/cgi-bin/fg.cgi?page=gr&GRid=26302632. “British Columbia Marriage Registrations, 1859-1932; 1937-1938,” database with images, FamilySearch (https://familysearch.org/ark:/61903/1:1:JD81-6GH : accessed 31 May 2016), George I Wilson in household of James Bain Allan and Jean Ingram Wilson, 21 Jun 1906; citing , British Columbia, Canada, British Columbia Archives film number B11373, Vital Statistics Agency, Victoria; FHL microfilm 1,983,530.